Got Style Blues? We can fix that! 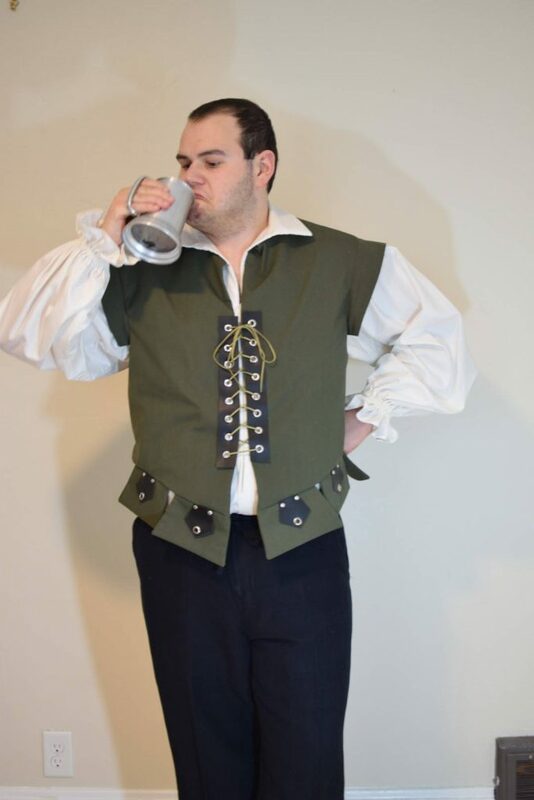 Renaissance costumes are fun to make, I made these costumes recently with my Cricut Maker. Choose fabrics such as cotton, linen or wool for a great result. Our son Ted was thrilled with the costume I made for him. Overall, it only took a couple days to put this entire look together. 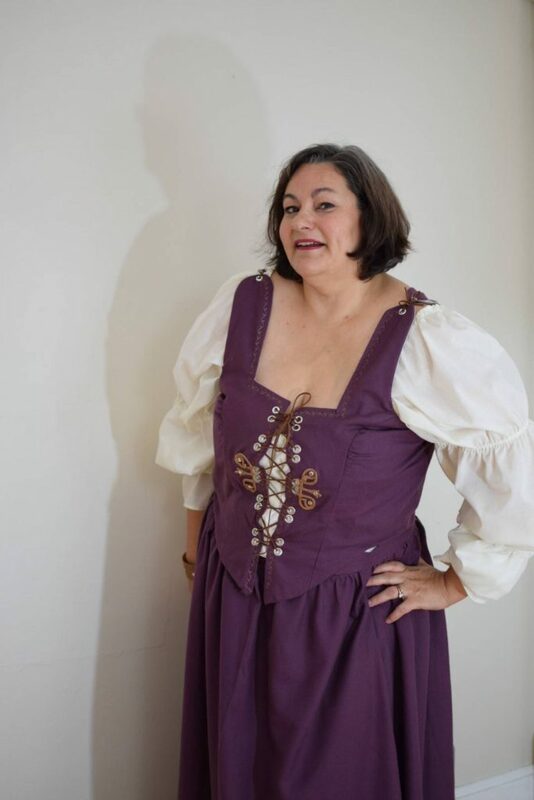 This is an historic costume by Simplicity Pattern #S4059. I really enjoyed making this men’s pattern. It is simple to follow and fits really well. I didn’t need to make any size adjustments which is so encouraging! 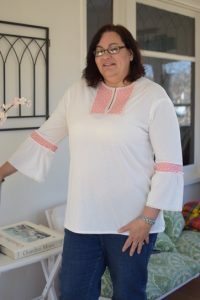 The white shirt was an easy sew using an old queen size sheet for fabric. The Renaissance time period calls for simple fabrics and colors, such as cotton, wool or linen. All of these are great choices and easy to find in stores. This outfit is cotton and linen. The sheet worked well for the white undershirt as the pattern is just HUGE. I used an entire queen size sheet to cut it from. Those big billowy sleeves require A LOT of fabric, but I love how it looks and I wouldn’t change it for the world. 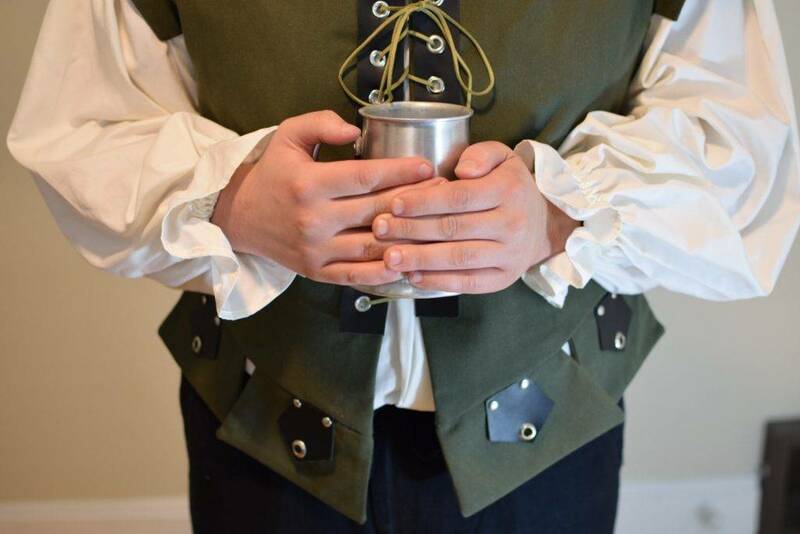 I did use interfacing in the collar and elastic in the cuffs, but you could easily do without them as they didn’t have that sort of thing back in the 13th century. As a costume, no one really expects things to be that accurate and I am all for modern inventions that still look fitting for the time period. The jerkin or vest features wide shoulders and a peplum hem. These were easy to make and attach with a few simple seams. 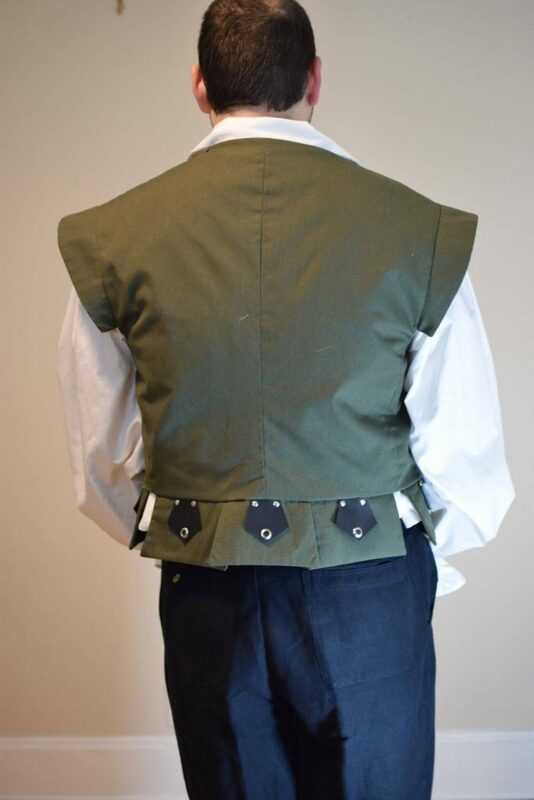 The green cotton broad cloth vest is lined, I used a scrap of mystery lining fabric from the thrift store for this purpose. It works great in this style. I didn’t need to make the trousers that were included with the pattern, we were fortunate enough to find a pair of black linen draw string pants at the thrift store in Ted’s size. We cut them off just under the knee and left the raw hem to add to the overall effect of the costume. The leather details are my own design and were cut on the Cricut Maker. Read the complete leather post here. 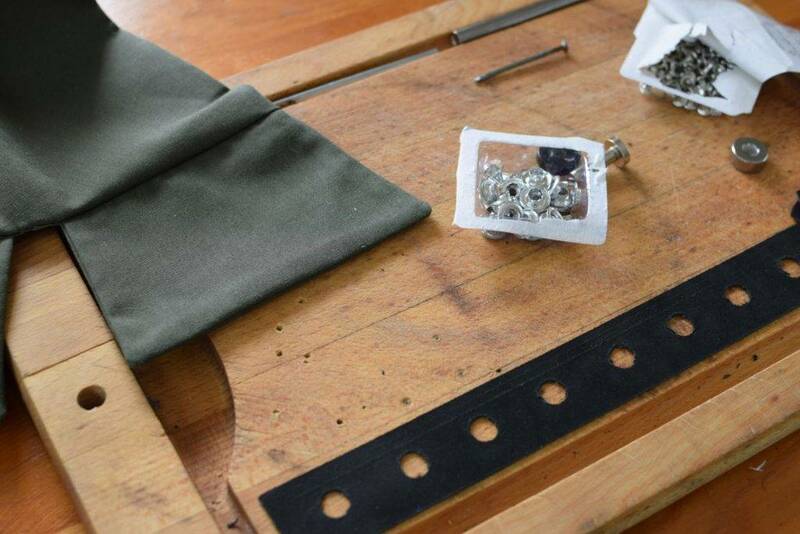 The leather pieces were attached to the jerkin with rivets and grommets. The leather placket gives authenticity and stability to the laced up front, and the grommets were easy to install through all layers with a hammer and a wooden cutting board surface to pound on. Grommets need to be pounded in place with a hammer. I won’t kid you, it took a bit of muscle to pound them all in place. But, sometimes it’s very gratifying to hammer away at something that has such a cool manly look. The vest is not washable, but could be sponged clean or dry cleaned with the leather trim. I am not concerned with longevity, I think it will hold up just fine. The front lacing is a faux suede cord I purchased at the craft store. This costume was much more time consuming to make. This pattern is Simplicity pattern #3809. I have made this costume before, several years ago so I was already familiar with it’s construction. Overall this is not hard to construct, but the bodice is time consuming. 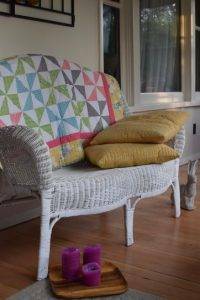 This time I used different fabrics that required more special care. The corset and over skirt are cut from wool crepe that I found at the thrift store. Wool cannot be ironed directly, you must use a press cloth when pressing all seams. Without a press cloth, the material will have an un-natural permanent shine left from the heat of the iron on the surface. In addition, the seam allowance can leave marks on the right side if it is over pressed. Ideally you should use a pressing ham for pressing the seams to avoid this problem. I used a rolled up towel instead, I haven’t invested in a ham to date but hope to get one soon. As usual, I had to make a large number of fitting changes for the bodice and skirt pattern. The corset was lengthened for my long torso and widened to fit through the waist. The skirt was widened and lengthened as well. I am not very happy with the over all fit of either piece, there are too many puckers for my liking, especially on the corset. Most of the problem is due to the interlining and fabric that I used to line the bodice. 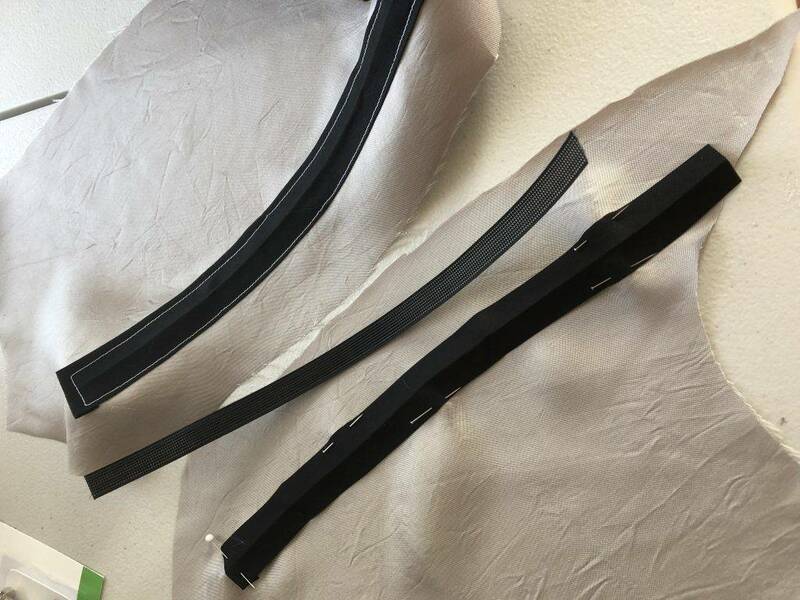 1/2″ wide plastic boning is stitched to the lining fabric. 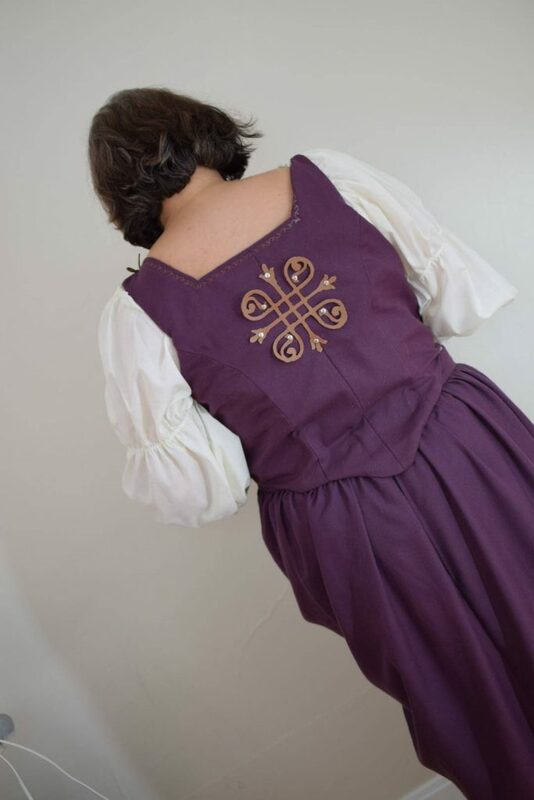 The Simplicity pattern calls for the bodice fabric, interlining, and lining. It has three layers. When I made this style in the past, I used a tapestry for the corset, with muslin interlining and muslin lining. That garment fits me well and is very comfortable to wear. This time, I tried a stiffer interlining thinking it would work better for a more structured garment. 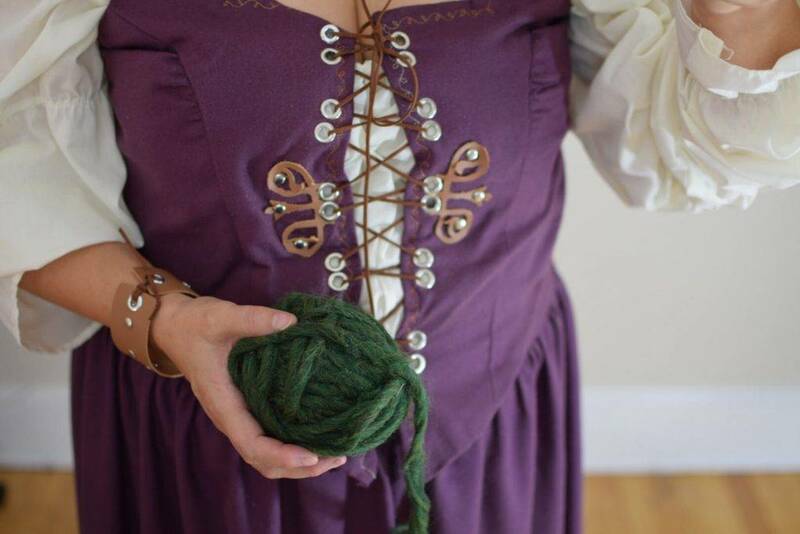 I used drapery bastiste as the interlining, which is a thin cotton but very stiff and rigid. It was recommended for making corsets on another blog, and I don’t care for it at all. The purple wool crepe is wonderfully form fitting and shapes easily, but paired with the stiff interlining, it doesn’t shape at all the way it should. 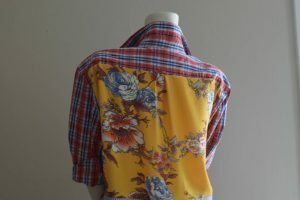 The combination of the two incompatible fabrics creates all sorts of puckering that wasn’t there before when I sewed this pattern from different materials. Also, the lining is too thin and doesn’t offer any additional support. It would work better to have the boning attached to a thicker fabric (you can see it warping in the wrong direction above) such as muslin which is what I used in my first attempt at this garment. The thin lining, stiff boning and even stiffer interlining just don’t seem to work together the way they should, but rather cause rippling and puckering when they pull against each other. The casings for the boning were made from pieces of bias tape stitched on either side, then the 1/2″ wide plastic boning was inserted. 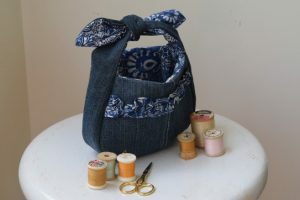 Boning supplies can be ordered online from Vogue Fabrics Store. I would not use a drapery product again for this style, I can actually feel it against my skin through the lining. It’s very scratchy and uncomfortable. I am not sure if I want to rip it all apart and remove it, but I might do that eventually. The bodice has several rows of plastic boning stitched into the lining, which is just a scrap of grey satin from the thrift store. Ideally, I would like a lot more boning for support as I don’t think this design provides enough for my large figure. 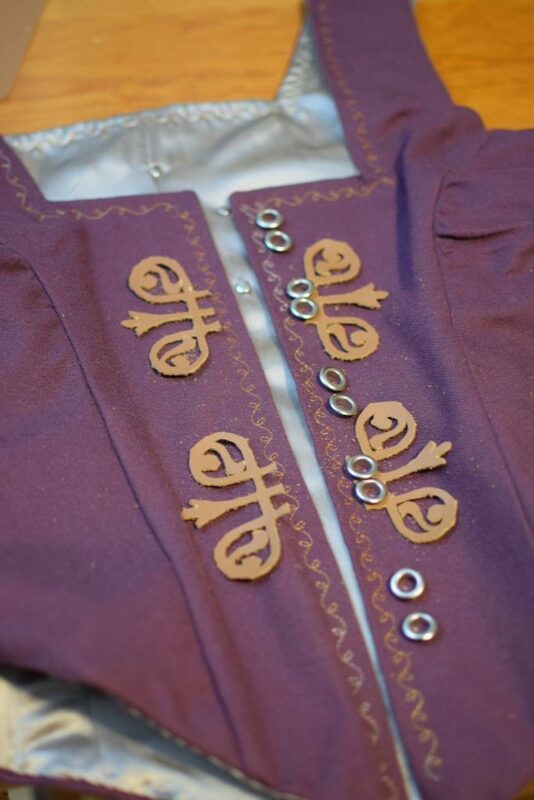 The gold leaf embroidery detail was added around the neck and center front using a varrigated embroidery thread, before the grommets and leather details were installed. 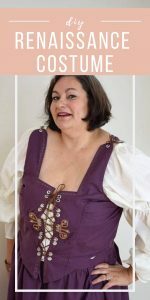 I have been studying corset fitting and drafting for some time, and I think it would be best for me to draft my own pattern next time around. I have too many fit issues to contend with and I think I would be happier with the result of a custom pattern. 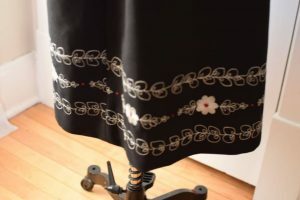 Also, I am going to invest in some french Coutil for my next corset, it is expensive fabric (about $25.00 a yard) but authentic for corset making and is perfect for shaping a good fitting garment. The chemise was one I originally made from the same Simplicity pattern a few years ago. Made from ivory cotton voile, is is thin and comfortable. It has three rows of elastic in the sleeves to create the full sleeve look. I love it and occasionally wear it out under a vest for special occasions. The front of the corset has grommets and leather trim that was a design I cut on my Cricut Maker. You can read more about that tutorial here. The grommets were easy to apply to the wool, and the lacing is faux suede cord from the craft store. I was not prepared for how much the corset would change my figure. After lacing it up, my skirts were huge. A corset can easily change your waist measurement by several inches, I forgot this when I measured my waist for the skirt. I need to make skirt smaller so it will fit my shape after corseting. This is a good problem to have! 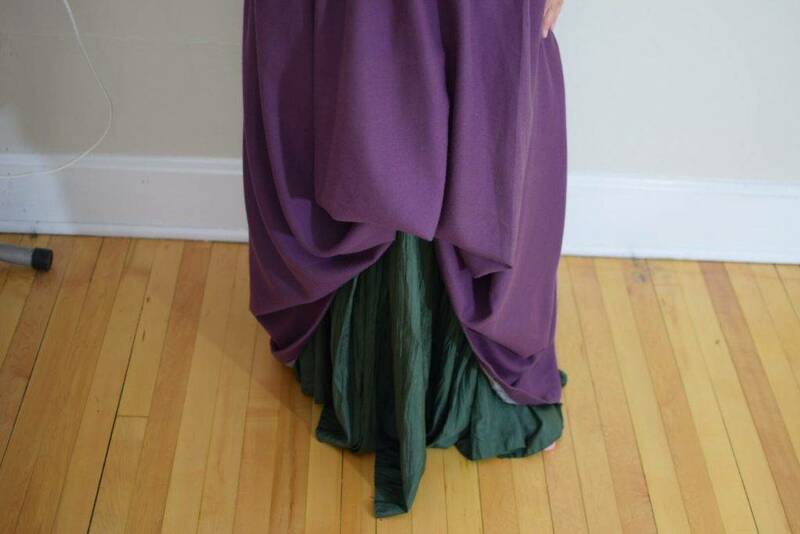 The green underskirt was a silk skirt that I found at the thrift store for a few dollars. I should have added pockets to the over skirt, it didn’t occur to me at the time but next time around I will add them as well. The only bad thing about the underskirt being silk is that it is very slippery against the purple wool fabric over skirt. I will need to tack the over skirt up in place so it doesn’t slip down over the bottom layer when wearing it to the Fair. That’s it! Hope you enjoyed this tutorial, I have so many fabulous things on my cutting table stop by again soon and see what’s happening! Don’t forget to Pin this post! I love to answer questions from my readers! Hi, I’m Jessica. 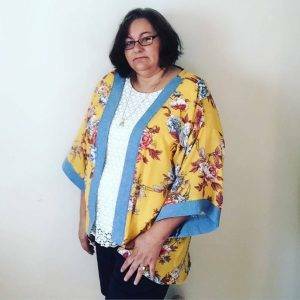 I am an apparel designer and sewing teacher. 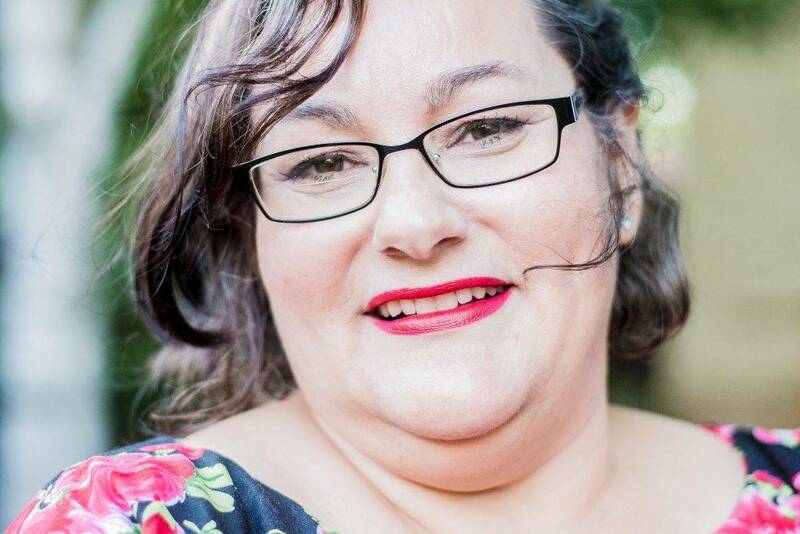 Sewing is my jam, and I hope you will join me as inspire women to sew beautiful clothes. I love refashioning, classic style, and celebrating midlife. For more info and my complete bio, check out my About page. Got a great idea? Let’s collaborate! Contact Jessica@chambrayblues.com. Watch my recent video tutorial! Got Style Blues? Join here for style solutions! 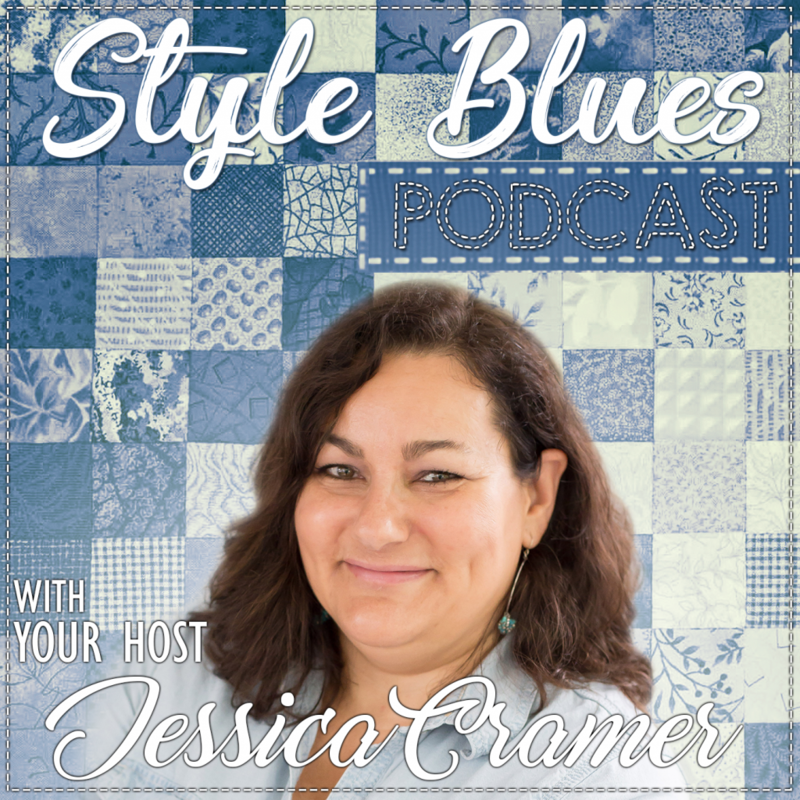 Subscribe to the Style Blues Podcast! This tiny purse is perfect for kids or a casual night out. Add style to your t-shirt with this easy pattern hack! This kimono has contrasting bands on the front and sleeves.